I've spent most of today baking and decorating a tenth birthday cake for our niece, Maria. Cake decorating is my idea of a really, really good time. It's only surpassed by eating a cake that someone else has made for me. I've been decorating cakes as a hobby for about seven years now, and while I might tear my hair out occasionally when things go wrong, it's immensely satisfying when it all comes together. One of the nice things about cake decorating is that it allows me to take the beautiful designs that I dream up in my head and am utterly incapable of putting on paper--I am rubbish at drawing--and turn them into almost-perfect fondant works. I thought I'd take you with me on a trip down my (cake-tastic) memory lane. 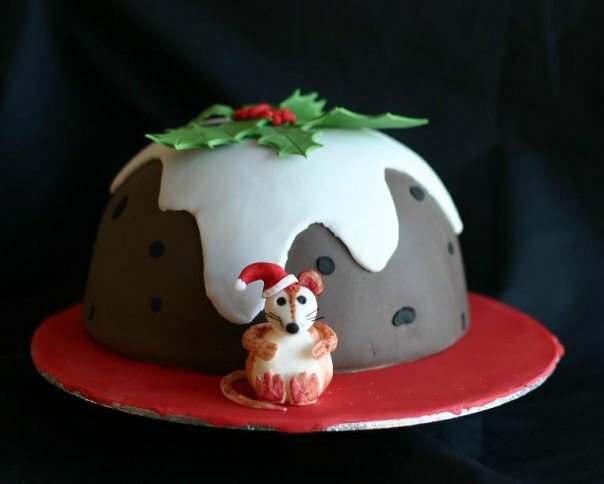 So, without further ado, here are some of my favourite cakes! 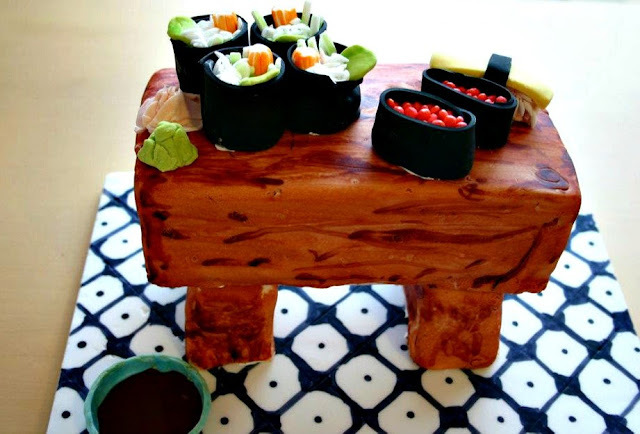 I made this Sushi Cake for Dave's birthday a few years ago after he got hooked on sushi. It was a lot of fun to make, despite being pretty complex. The design comes from Elisa Strauss's Confetti Cakes book and has really great instructions. I learned a lot from making this one! In case you're having trouble reading the inscription, I'll save you cricking your neck: "Whosoever holds this hammer, if he be worthy, shall possess the power of Thor." 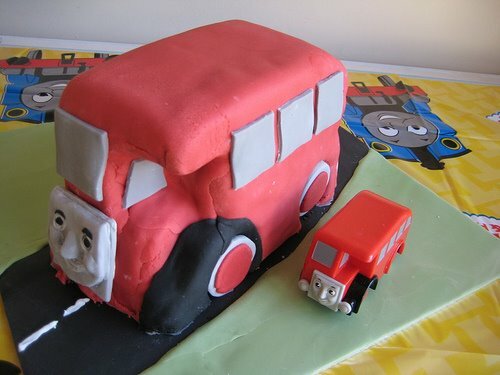 I made this Bertie the Bus cake (from Thomas the Tank Engine and Friends) for Lucas's second birthday when he was utterly obsessed with watching Thomas and got super-excited when the episode had Bertie in it. He used to toddle around clutching his little toy Bertie in his chubby hand. It was adorable. Every cake is a learning experience and with this cake I learned that making your own red fondant is a nightmare. Even with Extra Red gel colouring you'll never get it the right sort of red. Just shell out and buy ready-made. Triceratops cake--so much fun to make! A year later and Lucas was now obsessed with dinosaurs. He had a rhyming book of dinosaur poetry that we had to read to him every night. 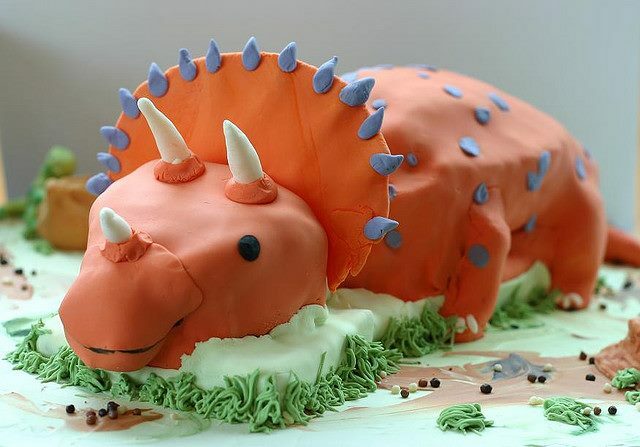 The triceratops was his favourite, so I spent ages carving it out of a couple of loaf cakes. It's amazing how inventive you get when you have kids! Right at the back is a baby T-Rex, just hatched from the eggs the nest. 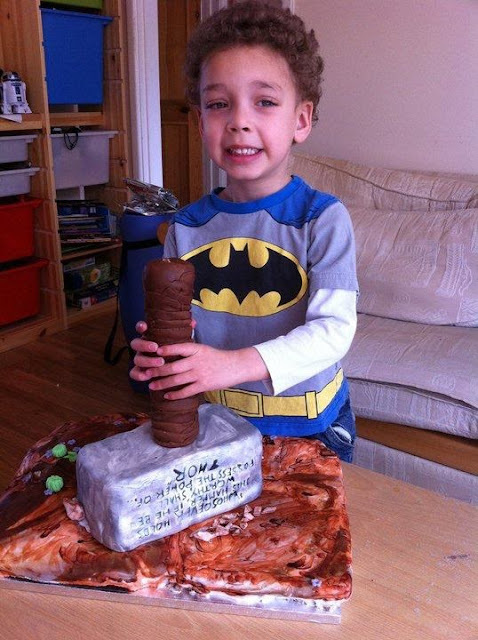 This is probably my favourite cake ever. I made it for a Guess The Weight of the Cake competition at a friend's school. I still love the little mouse; painting him totally brought him to life! Lastly, I was honoured to be asked by my little brother to make a traditional Bajan (Barbados) Rum Cake for his wedding last year. 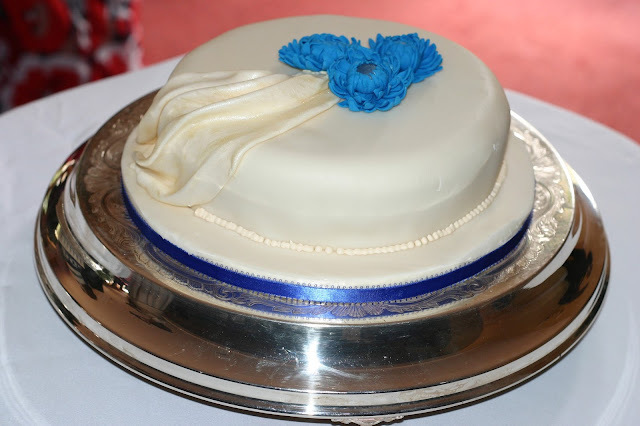 I had a hell of a time making royal blue gerberas--amazing how much gel you need to get the colour right!--but it all came good in the end and the cake survived an 8-hour drive. I was so proud to see it on a silver cake stand beside the official wedding cake. It's their first anniversary on Sunday--Happy Anniversary Alan and Gemma! PS. 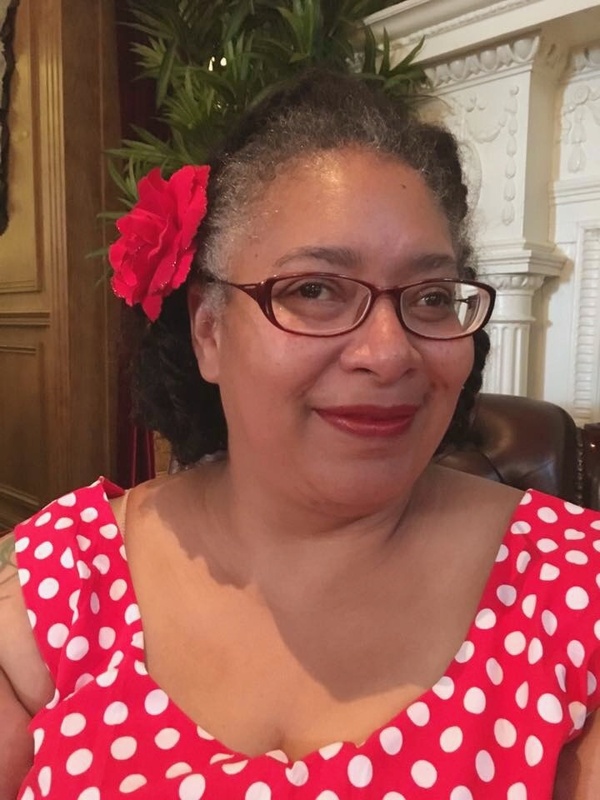 I'm thrilled to have been nominated for a Liebster award by Annatha from Prattle and Froth! Thanks so much, Annatha, I'll answer your questions at the weekend! That sushi cake is INCREDIBLE! Thanks, Michelle! There were a few step-by-step pictures on the web when I made it, and the instructions in the book were v.detailed, so I couldn't go far wrong! Awww, thanks Annatha! I only get to decorate cakes two or three times a year these days, so I tend to go a little overboard! Triceratops was a fun cake to make! Such amazing cakes! The dino one is amazing, and I love the detailing on the little mouse - so cute! Beautiful cakes,Angela! 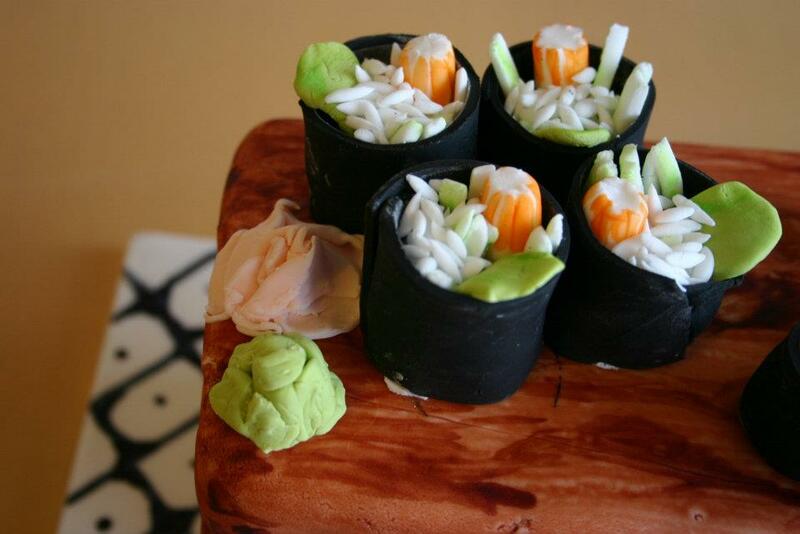 My favorite has got to be the sushi cake. Amazing! Thanks, Ritchil! It was a really fun cake to make, and tasted great, too!